I've taken a look at the state of vector graphics in the browser. Since the beginning of the web, people have been using GIFs to display their headline texts; tables and CSS to do layout; and GIFs for rounded corners etc. A lot of this would become a lot simpler if the browser was able to display vector graphics. There are numerous systems for displaying vector graphics but the two I looked at in detail were the <canvas> tag and DOJO. Initially I realized that the <canvas> tag could not plot text, and I thought the DOJO system could. But it turns out it can't either. So I concentrated on the <canvas> tag. The <canvas> tag, which works on Firefox, Safari and Opera, and a 1-line Javascipt include of excanvas, also works on Internet Explorer. It works well for trivially simple things. But there are a few things that don't work like I expected. The traditional way is certainly more complex, but it has a few advantages. If you are doing any kind of document editing, e.g. you are programming Word, then documents get big. But only a small amount is displayed on the screen at once. This gets more marked if you zoom in to 500%. With the callback mechanism, your application only get asked to draw the small part of the window on display. With the <canvas> approach, you have to draw everything, all the time. Imagine a grid which needs to draw lines every 5 pixels. That's a lot of lines on a 1,000 x 1,000 pixel screen; but it's a lot more if you need to draw everything in a 10,000 x 100,000 pixel workspace that the user could scroll around on. It simply takes too long to draw everything the user could possibly see if you have a large workspace, or view a large document at a higher zoom. On a 5k x 5k pixel <canvas> with such a grid, Firefox complains "script seems to be unresponsive", whereas on a 1k x 1k grid (which is all you can see) it works fine. As a <canvas> is just a bitmap, if you create a large one, a large amount of memory is immediately allocated. So if you are programming a Word using this technique, and the user scales the document to 500%, immediately their computer will slow down as the browser needs to allocate a huge amount of memory just to store all the pixels the user could potentially scroll around to see. And the Internet Explorer control and the Opera <canvas> seem to have a limit somewhere around 5k pixels. This is surely the most amazing limitation. Look at all the vector graphics examples in the web and you'll see e.g. 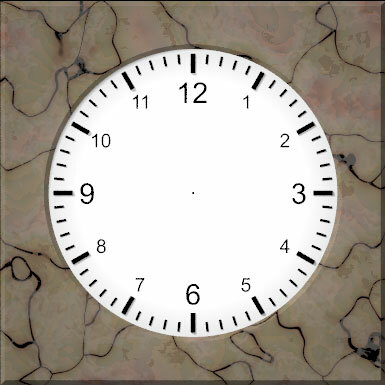 beautiful clock examples – but they use a JPEG as the background to the clock including the numbers. That's hardly the way I had imagined vector graphics would be used! But there is a "solution", as we see in this nice windowing example. As the browser can already display text, and the background to a <canvas> is transparent, you can layer one <canvas> on top of another, and put <div> objects inbetween. If one is to display e.g. a Word document, with various vector graphics and various pieces of text, one would have to create lots of <canvas>es and lots of <div>s and absolute-position them on top of one another. That seems to me like a lot of programming work to create this structure, and to maintain it. And it can't be easy or quick for the browser to render such a document. There is a solution in sight though. There will be a <canvas> drawText command in Firefox 3. Currently nobody has Firefox 3 and none of the other browsers support it. But that will no doubt be different in a few years time. If you want to have vector graphics and text on the same page, you need a way to find out the size of text in pixels. For example you want to center text on the screen. Or fit text into a weirdly shaped object. Thankfully this is supported with the Firefox 3 drawText command. I always object to the name SVG on the grounds that it stands for "Scalable Vector Graphics", and vector graphics are scalable by their nature, so I don't understand why the file format wasn't just called VG. But it seems someone has indeed managed to implement what I thought was impossible: "non scalar vector graphics". So what is one to do to implement a client-side app manipulating vector-based documents? It is clearly the way of the future. As far as I can see, it's still not very easy. Which may explain why there are none of them around. The only one I can think of is Gliffy – and that's written in Flash. An alternative scrolling technique will have to be found. If the user is manipulating a large document, or a small document at a high zoom, then creating one big <canvas> and using the browser scrolling isn't going to work. One will have to implement ones own document-navigation (i.e. scrolling) system. This will not be what the users expect. But it's the technique that Google Maps uses: it doesn't have windowing-system scrollbars to let you pan the viewable area within the original document (the world map): it has its own navigation system. Displaying text is going to be a pain. No more myDocument.display(graphicsContext) – where the code to display the document is decoupled from the particular drawing implementation. The code to display a document is going to have to be quite tightly coupled with the display system (create and maintain <canvas> and <div>s). And for making modifications, I'm not sure if it's going to look nice to delete those <canvas> and <div>s and recreate them each time, maybe one is actually going to have to modify them e.g. during a drag operation, which will make the code particularly front-end specific.